7 years and we couldn’t feel any luckier! We have the most extraordinary Consultants, Customers and Home Office Team imaginable! Every day for the past 7 years we have been lucky enough to help change the fragrance and the lives of so many. 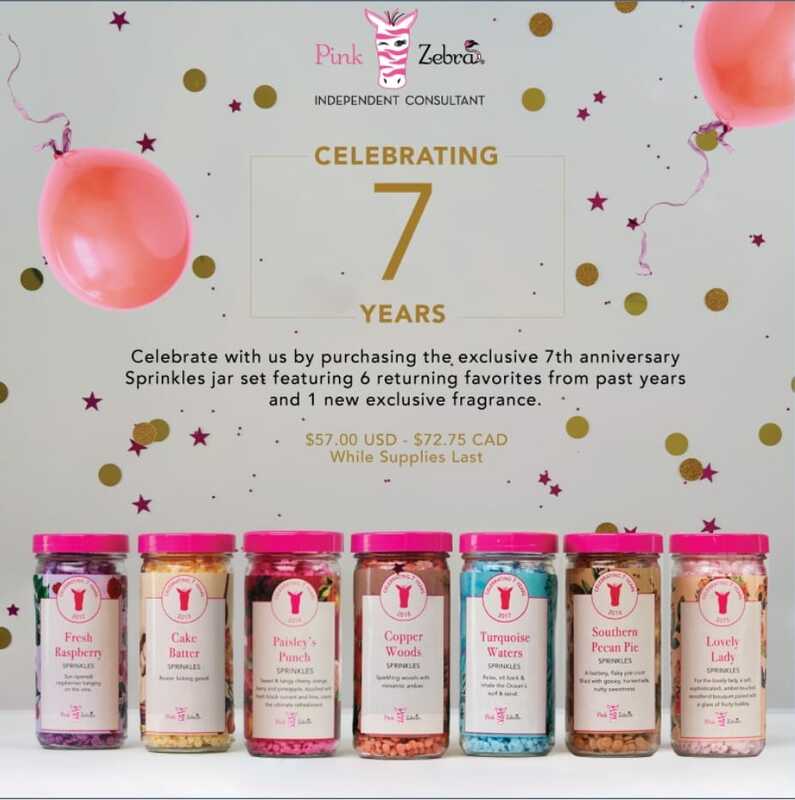 Join us in celebrating 7 incredible years! 🎉 🥂 💕 I am so pleased to have joined Pink Zebra and I am so proud to be part of this company. We have changed so many lives and the support we give to single mothers through donating days of FREE daycare and also offering scholarships for single moms to go back to school just warms my heart. This limited set includes 6 top sellers from the past and one exclusive anniversary fragrance ~ Copper Woods! Fresh Raspberry- Sun ripened raspberries hanging on the vine. Cake Batter- Beater lickin’ good! Paisley’s Punch – Sweet & tangy cherry, orange, berry and pineapple touched with fresh black currant and lime create the ultimate refreshment! Lovely Lady- For the lovely lady, a soft, sophisticated, amber-touched woodland bouquet paired with a glass of fruity bubbly. Southern Pecan Pie- A buttery, flaky pie crust filled with gooey homemade nutty sweetness. Turquoise Waters- Relax, sit back & inhale the ocean’s surf & sand. Copper Woods- Sparkling woods with romantic amber. Author Diana PencePosted on September 9, 2018 Categories About Pink Zebra, Pink Zebra Business, Pink Zebra Candles, Pink Zebra Consultants, Pink Zebra Recruiting, Pink Zebra Sponsoring, Work From HomeLeave a comment on Pink Zebra is Celebrating 7 Years!